The Law Society has today launched the UK’s first ever ‘voicemail protest’ for Sound Off For Justice (a campaign against the proposed government cuts to legal aid). Members of the public are encouraged to voice their discontent with the government’s proposed cuts by leaving a rant on Ken Clarke’s voicemail. 1. Go to the Sound Off for Justice website and fill in your mobile number. 2. 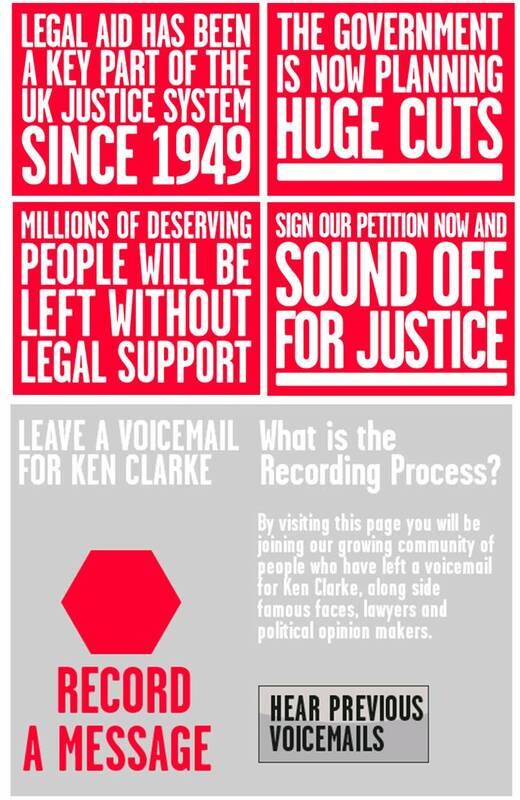 ‘Ken Clarke’s’ (voiced by Alistair McGowan) voicemail calls your mobile. 3. You wait for the bleep and then leave your irrate message. It’s a nice, modern take on the usual ‘fill in this leaflet and post it to your MP’. And, the fact that the web/mobile technology does most of the leg work for would-be advocates is smart i.e. no need to dig out the old microphone / webcam. The issue with such campaigns, as anyone who’s ever worked in an MP’s office will tell you, is that MPs read (or in this case listen to) the first couple and then ignore the rest. The ‘audio’ nature of the campaign means that it is unlikely to go viral, as listening to lots of people mouthing off just isn’t that exciting or stimulating. Nevertheless, for what it is, it’s very nicely put together.